The watershed suffered from nearly a half-century of chemical pollutants from area abandoned coal mines, which nearly wiped out the brook trout populations in some Casselman River tributary streams. To restore the 66-square mile watershed back to a nearly pristine condition, crews scoped out 15 sites for the project. Limestone treatment systems were built to enhance and improve water quality. Just so you know I do not make up this stuff up, the original version of this arrived Thursday from the National Forest Foundation. I did add to their news release. Due to the frequency otters are in and out of the water, their fur needs to withstand wet and dry. Water repellent fur helps keeps them warm and dry. Although quite expensive otters gloves are available. Otters can stay underwater for eight minutes. This is helpful know if you trap an otter in a wire trap. When submerging the cage underwater, go get a cup of coffee and bagel. Come back half an hour after to retrieve the trap and remove the corpse. As a sometimes aquatic creature, it shouldn’t be a surprise that otters can swim up to seven miles per hour and dive down 60 feet. Shooting otters is most easily accomplished when they are out of the water. Otherwise you just never know. It’s no surprise that otters love to fish, but they’re also partial to amphibians, turtles, and crayfish. Of course, they do. Once a stream is depleted by of trout or bass, why not kill off its secondary residents. Fathers do not play a role in parenting. Females will go to their underground den to deliver anywhere from one to six young. At about two months, they’re pushed in the water and made to swim. Even the momma otter is not fond of the bastards. In the winter, otters have found the easiest and perhaps most fun way to get around is by sliding. After a few bumps, they can slide up to 22 feet on the ice. In warmer times, you may also see otters sliding down a riverbank. The perfect set for using a .222 to dispatch these trout eating vermin. Otters thrive on land and in the water. Whether it’s a lake, river, swamp or estuary, otters like a mix of land and water. They can be found throughout North America and our National Forests. Loveable, eh? The time has arrived. Tuesday Nov. 27th, the five largest aquarium tanks will be delivered. We will need a forklift with extended forks and a pallet jack on-site for the day. The forklift can be returned as soon as all the tanks are secured inside that day. We may need the pallet jack late in the day. I will send out another note with the expected approx. time of delivery once they contact me with that information...however, unless we are the first delivery of the day which we have requested at 10 am, the information is an intelligent guess on their part. Briefly, here is my understanding of what we need to do that day. Truck will have to come in on Collins Street from another street other than Island Drive. When truck arrives, fork lift will be used to take the tank(s) off. The first tank to be placed is the rimless, largest tank for the mountain stream. the forklift will position the tank on its pallet at the back door. The 1000 pound tank and the tank foam mat will be removed from the pallet at the door. lifted inside onto the pallet jack via suction cups and about 8-10 people (I have 5-6 people lined up). We will use a few empty pallets to place the tank to a height for easier lifting and positioning at the tank stand. The OSB board has to be cut for the piping positions. The mat is put in place with double stick tape and holes cut for the piping also. The tank is lifted and positioned via suction cups and about 8-10 people (we have a few alternative tricks to move and position the larger tanks if need be - small diameter pipes to roll the tank into position, plastic wedges to drop in place). We will do the same steps for the other rimmed, large 1000 pound tank. these two tanks will be the primary challenge. The other three will be done roughly in the same manner but they weigh less and will not require more 4-5 people to lift. The goal is to have the five large tanks in place that day. I plan to bring the suction cups and the double stick tape. Jim Estes, Tim Hensley will bring the skill saw, pipes, wedges and other tools to bring the mountain stream platforms together as each tank is added. Chris Holler, his buddy Austin and possibly one more plan to be there. I will come up with someone from Upscale Aquatics who is experienced in handling these large tanks. Patricia Pezza and Jon Smith may be able to be there depending on their night shift schedules. So, Tanner will need to have 4-6 local crew there for a few hours to get the first tanks in place, then they can be freed up. If Eugene (fly shop guy) could be there it will help and I know they would like to be a part of this big event if they can be. An environmental assessment for a rule that would allow members of the Eastern Band of Cherokee Indians to gather sochan in the Great Smoky Mountains National Park is out for comment through Thursday, Dec. 13. The early spring leaves of sochan, also known as the green-headed coneflower, have traditionally been an important food source for Cherokee people, whose large territory used to encompass the area now covered by the park. The Qualla Boundary currently abuts the park boundary, but gathering any type of plant or plant part is uniformly prohibited in the Smokies. Under the proposed rule, up to 36 tribal members would be able to gather sochan each year, with participants selected through their respective community clubs on an annual basis. Those with a permit could be accompanied by up to five other EBCI members during gathering. The “turkey foot” of the perennial sochan plant — consisting of the upper three leaves as it begins to grow from the root in the spring — would be the only part that could be gathered. Permitees could gather a maximum of half a bushel per day and half a bushel per week of the leaves, with an annual limit of 12 bushels. They would be required to use official collection bags provided by the EBCI Department of Natural Resources. The season would be limited from March 1 to May 31, a period that encompasses the time when early spring leaves are available at various park elevations. Gathering would be relegated to areas within 100 meters of official roads, trails or the park boundary, and should be done out of sight of high visitor use areas and research areas. The proposed rule stems from a 2016 rule that allowed the National Park Service to permit members of federally recognized tribes to gather plants for traditional purposes. The resulting Environmental Assessment analyzes the potential environmental impacts of the proposed action. The assessment is available at parkplanning.nps.gov/grsm by following the link for sochan gathering and clicking on “document list.” Submit comments through the website or mail them to Great Smoky Mountains National Park, ATTN: Environmental Planning and Compliance, 107 Park Headquarters Road, Gatlinburg, Tennessee 37738. A rainbow-colored fish that’s considered among the world’s most beautiful in freshwater and found only in picturesque Appalachian streams has been listed as “endangered,” by the U.S. Fish and Wildlife Service. Those who were around then may recall the snail darter controversy that delayed of the construction of the Tellico Dam on the Little Tennessee River in 1973. On August 12, 1973, University of Tennessee biologist and professor David Etnier discovered the snail darter. The discovery of the “$37 Million Dollar Fish” gave the execution of the Little T a temporary reprieve. Could the Candy Darter put the shoe on the other foot by hurting West Virginia trout stocking futures? Along with other stream dweller such as brook trout, the candy darters’ population first took a hit from logging and other human endeavors last century that had pushed dirt into the water, Richard said. The sediment filled open spaces between rocks in stream beds where candy darters live and feed on bugs. The dirt also disturbed the sandy areas where eggs are laid. The variegate darters are mating with the candy darters in the watershed of West Virginia’s Greenbrier River. And they’re threatening to enter streams connected to the Gauley River, also in West Virginia. So far, a dam seems to be keeping them out. They’ve made it all the way up to the castle wall and they’re knocking. In Virginia, candy darters are found in only four places, all of which are in the New River watershed. Those areas have not been infiltrated by the variegate species. The listing under the Endangered Species Act means that more resources will be dedicated to protecting the fish. For instance, more money could be available to fund research to possibly address the hybridization problem. And it could boost programs to breed the fish and reintroduce them to streams where they’ve disappeared. They are also looking into competition to the candy from stocked trout. The Center for Biological Diversity and other environmental groups had petitioned for federal protection of the fish in 2010. The center said it then sued for protection in 2015. Watch our website and our Facebook for voting to open! The Third Annual ST Hall of Fame induction is scheduled for February 1st at the Atlanta Fly Fishing at the Infinite Energy Center. The popular induction is a people’s choice awarded determined by your votes. Nominations have been recorded here for several week, and the nomination period is officially close until next year. The ST Hall of Fame was created to recognize various contributions of fly fishing in the South. 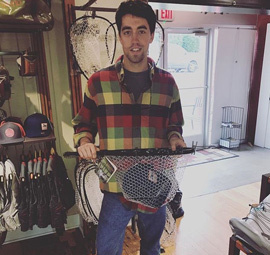 , Ben Furimsky - President and CEO - Fly Fishing Show and sponsor of the Hall of Fame is again generous enough to provide the most outstanding venue of fly fishing in the southland. We encourage your participation and attendance later in Atlanta. It has been a very nice ceremony. For more information see the soon to be release D/J issue of Southern Trout Magazine. The beautiful Blue River near Tishomingo is the most popular of the winter trout areas managed by the Oklahoma Department of Wildlife Conservation. The state's six winter trout areas managed by the Oklahoma Department of Wildlife Conservation are now open for business. Whether you are an avid or just casual angler, all of them are worth a visit, and the trip can provide more than just fishing. Three of the winter trout areas are in state parks and the other three are near small towns that are interesting places to visit. The most popular winter trout area by far is at Blue River near Tishomingo. It's hard to find a prettier place to fish in the state or a better place to catch trout. 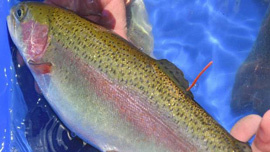 Over the 6¼ miles of trout waters in the Blue River Public Hunting and Fishing Area, the Wildlife Department will stock 59,000 rainbows through March. A portion of the Blue River is catch-and-release only. Between 5,000 and 7,000 people visit the Blue River monthly during the winter. Blue River becomes a community of its own during trout season as many people will spend days camping and fishing on the river. While at Blue River, you can also grab a hamburger at the Blue River One Stop or go into Tishomingo to shop and visit Blake Shelton's Ole Red restaurant and bar. For more outdoor adventures and wildlife watching while in the area, visit the Tishomingo National Wildlife Refuge and the Tishomingo National Fish Hatchery. The second most popular winter trout area is one of the newest at Medicine Creek in Medicine Park. Much like Blue River, it is a scenic place as anglers can fish for trout up and down a ¾-mile stretch of a cobblestone stream. Medicine Creek runs through the middle of downtown Medicine Park and can be seen from any establishment on the downtown strip. The historical city offers venues ranging from overnight lodging tepees to a local olive oil company. There are two cafes in town that provide local charm and great food. Nearby attractions include the Medicine Park Aquarium, the Wichita Mountains Wildlife Refuge with Mount Scott and Lake Lawtonka. “This hidden treasure in the southwest part of the state allows folks to enjoy fishing, great food, hiking and mountain bike trails, great opportunities for photography and an enjoyable day for the entire family,” said Ryan Ryswyk, head of the southwest fisheries region for the Wildlife Department. Of the three winter trout areas in state parks, the closest to Oklahoma City is Lake Watonga. The lake is part of Roman Nose State Park which offers hiking trails, mountain biking and horseback riding. If you go to Lake Watonga on a Friday or Saturday and are a wine lover, check out Whirlwind Winery in Watonga. It is only open two days a week but offers wine and cheese pairings plus unique wines such as Wild Sand Plum. If you really want to take a long road trip for trout fishing, Robbers Cave State Park in Wilburton has 1½ miles of trout fishing through March 15 on a portion of Fourche Maline River below Carlton Lake Dam. After a day of fishing, drive to historic Krebs for Italian food. On the other side of the state, Lake Carl Etling in Black Mesa State Park is stocked with trout through April. You can camp and fish in the state's highest elevation. The remaining winter trout area at Perry CCC Lake is an easy day trip from Oklahoma City. Fishing at Perry CCC Lake is like taking a step back into time as the pavilions near the south shoreline were projects of the Civilian Conservation Corps in 1934. The City of Perry requires a $3 daily fishing permit in addition to a state fishing license. While in Perry, you can dine at the historic Kumback Café which has been serving “down home” cooking since 1926. Also, check out the Cherokee Strip Museum and Perry Wrestling Monument Park with its statues of Olympians Danny Hodge and Jack Vanbebber. Tennessee has announced its 2018-19 winter trout stocking schedule. TWRA plans to release approximately 90,000 rainbow trout into Tennessee waters beginning in late November through March. The program provides numerous close to home trout fishing opportunities for anglers during the winter months. These fisheries also provide a great opportunity to introduce children or first-time anglers to fishing. 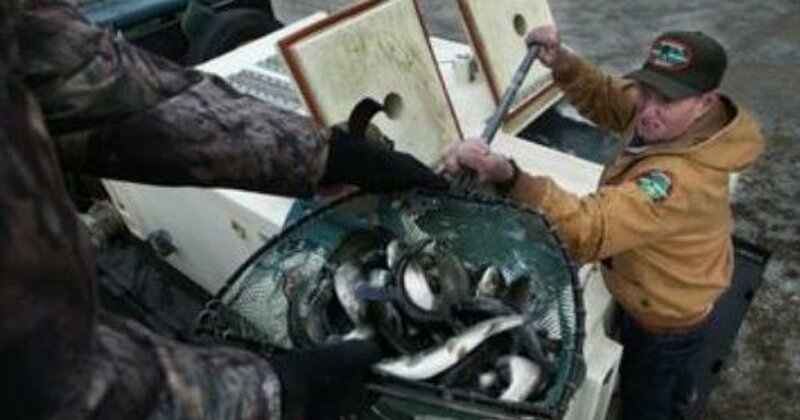 There are 43 locations for this year’s winter trout stocking program. The trout will average about 10 inches in length. The daily creel limit is seven, but there is no size limit. 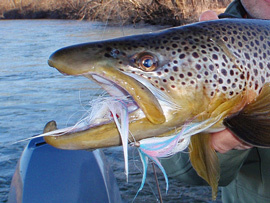 Anglers are reminded that a trout license is needed in addition to the fishing license. Please note that the dates and locations are subject to change. Updates can be found on TWRA’s website at www.tnwildlife.org. For areas not listed in this program, see the 2019 stocking schedule and tailwater schedule on the website. A weekly fly tying class has started at Outdoor 76 in Franklin, held 6 to 8 p.m. every Wednesday. All levels are welcome, and the class is free. Anyone interested is invited to stop by, make some flies and get a craft beer from the taproom. Outdoor 76 is located at 35 East Main Street. 828.349.7676. A presentation to the Mountain Home A&P Commission on behalf of the Sowbug Roundup. They were asked for $3300 and they gave us $3000.The Commission likes the Sowbug Roundup and the business that it brings to town. Sowbug Committee is meeting monthly to plan and work to make Sowbug better than ever for you. The invitations to demonstration tiers will be going out shortly and indications are that interest is going to be very high. If you want to be one of the “Stars of the Show,” be sure to register as soon as possible after you receive your invitation. In addition to the exceptional and talented fly tiers, this is a major social event. The theme this year will be Streamers, but this doesn’t mean that tiers must tie them. Demonstration tiers may tie whatever flies they wish. They’re currently considering some new features for Sowbug and John Berry will again be having his fly tying contest. With luck, we'll be able to have four tying classes of the caliber we had last year. If you would like to run a class or have a suggestion for a topic or a particular person who would be willing to do an appropriate class, please contact me. As the 2019 Sowbug Roundup approaches they’d like to encourage NAFF members to seriously consider volunteering to help in any capacity they can. NAFF is a relatively small organization (in terms of active members) and a lot of help is required to operate Sowbug the way we’d like for it to run. It is fun to be involved. You have the sense of accomplishment when you have contributed to a successful event, and you get to meet and socialize with a great bunch of folks. Please consider offering to help in some capacity. You will not regret your decision to become a part of the 2019 Sowbug Roundup! 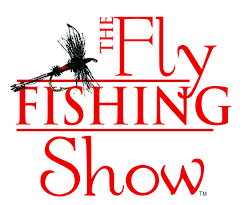 The South’s biggest fly Fishing show in Atlanta has launched its new information and schedule website, www.flyfishingshow.com/. The show hosts the Southern Trout Legends of the Fly Hall of Fame. The new platform is “Much more mobile device friendly, easier to navigate, and significantly faster,” according to Fly Fishing Show president Ben Furimsky. “There is a modern, all-encompassing, updated feel. It will make everything less complicated, from ticket purchases to class registration,” he concluded.